We’d love your help. Let us know what’s wrong with this preview of Someone to Stay by B.M. Sandy. Life is short - this Cassie Mills knows. In the wake of a devastating loss, she has reshaped her life, carving out a limited place for herself with her grief-narrowed perception of the world. But when Jake Mason, an elusive yet famous British actor, comes to her small Pennsylvania town with an entire movie crew to film for two months, she is Two lovers. To ask other readers questions about Someone to Stay, please sign up. 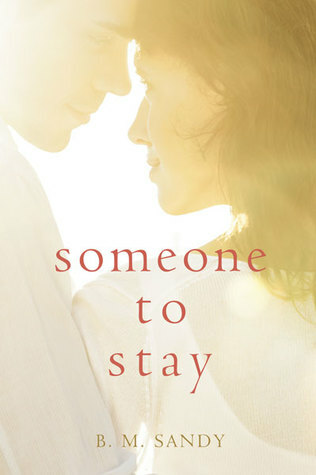 In Someone to Stay, Cassie Mills’ life was turned upside down because of a terrible loss, and she’s struggling to reshape her life. Jake Manson, an elusive yet famous British actor, come to her town with his movie crew to film for two months, and Cassie is asked to cater to Jake and his colleagues in the hotel restaurant where she works. She has a strange but memorable meeting with Jake Mason, the actor who is otherwise best known for keeping to his privacy. Cassie fears she may never see him up close again… But then she does, and the two of them connect in ways she never thought possible. Cassie and Jake are amazing characters. The author did a phenomenal job crafting them as believable and realistic. The story may not be the most original (superstar falls ofr small town girl) but Cassie and Jake’s personalities make it really worth your time. The story is sweet and swoonworthy, and the writing is excellent. I'm not gonna lie, I blazed through this book because I HAD to know what would happen! Someone to Stay is a sweet romance that had me gripped from the beginning (with more than a little help from the incredibly swoon-worthy Jake! We need more Jake's pronto!). Beyond the love story, this novel deals with loss in a way I've rarely seen in other stories. It was honest, heartbreaking, and brutal at times. I loved that it showed that there is more than one way to grieve, and even more ways to heal. Lo I'm not gonna lie, I blazed through this book because I HAD to know what would happen! Someone to Stay is a sweet romance that had me gripped from the beginning (with more than a little help from the incredibly swoon-worthy Jake! We need more Jake's pronto!). I could not stop reading this book!!! Such a beautiful story of overcoming loss, of moving forward and finding happiness. You will absolutely fall in love with Jake and Cassie. Can't wait for more form this author!! DISCLAIMER: I received an ARC of this book for honest review. My opinion is my own and remains unbiased. Thank you so much to Silver Dagger Book Tours for giving me the opportunity to participate in the tour. This book was perfectly in my element. I am a huge fan of contemporary romances. Jake and Cassie are amazing characters. I love the "fake girlfriend" deal and how they start to have feelings for each other. They mingle so well. The flow of dialogue was very believable. They definitely felt r DISCLAIMER: I received an ARC of this book for honest review. My opinion is my own and remains unbiased. Thank you so much to Silver Dagger Book Tours for giving me the opportunity to participate in the tour. Hi, I'm Brittany. I write contemporary romance books full of feels. I also have a huge crush on Marvel superheroes, scary shows and Star Wars. Let's be friends!